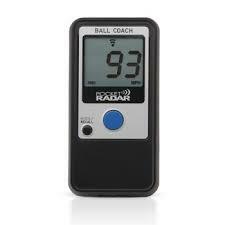 Ball Coach Pocket Radar For Baseball and Softball to measure Ball Speed of pitchers and position players. Ball Coach Pocket Radar™ is the world's smallest full performance radar gun. New updated version! This award-winning device delivers the same great accuracy and performance as other professional radar guns, at a fraction of the cost. Perfect for a wide variety of applications including traffic safety and sports. Independently tested and certified to be accurate to within +/- 1 mph, it gives over 10,000 readings on a single set of batteries. Includes a hardshell case, wrist strap, 2 AAA alkaline batteries, and an illustrated Quick Start Guide. Very Accurate. Easy to carry. Records the last 25 readings. Just press and hold and capture the highest speed of the ball. works up to 120 feet.